In 1950, Paul BerthomÃ© and a pharmacist friend established a business with one purpose in mind--to give new mothers a way to keep their babies' skin healthy and soft. The men formulated a gentle cleanser especially for the needs of infants' skin, marking the start of a collection that is now one of the biggest sellers in Europe. Their brand, Mustela, is trusted by maternity wards in hospitals throughout France and sells more than 10 million products worldwide, thanks to the proven effectiveness and extremely gentle nature of the brand's products. Over the last 60 years, the Mustela skin care collection has expanded to include products for expectant mothers. These formulas allow women to treat the skin conditions that often accompany pregnancy without fear of harming their babies. Additionally, the toxin-free, safe maternity skin care collection includes daily skin care formulas that can be used to form complete daily regimens throughout pregnancy. Mustela products are also favorites for baby shower gifts and presents for newborns. Shop the collection to discover a better way to care for Baby's skin and yours! You may have heard of Mustela, but how much do you really know about the brand? Safety is Mustela's top priority. All of Mustela's products are created with the help of healthcare professionals. Before going to market, each product undergoes rigorous clinical trials and testing to confirm their safety and efficacy. And the entire range is hypoallergenic and free of alcohol, parabens, phenoxyethanol, and phthalates. Natural ingredients power the Mustela range. Avocado extract nourishes and calms fragile skin and is central to a variety of Mustela formulas including baby shampoo, nursing balm, and stretch mark lotions. Sunflower oil distillate is an emollient that is an anti-inflammatory agent. You'll find it in Mustela's cleansers and moisturizers. White lupin extract promotes the skin's firmness, elasticity, and suppleness. It is an ingredient in skin care for the abdomen, bust, and legs. Shea deeply conditions the skin thanks to its essential fatty acids and vitamins E and F. Look for it in Mustela creams that soothe stressed skin. Aloe vera is rich in amino acids, minerals, and vitamins, and helps to repair irritated skin. Mustela products that contain aloe vera include a cradle cap balm and wipes for delicate skin. Mustela is committed to minimizing the impact that their business has on the environment. Mustela encourages their consumers to reuse or recycle product bottles. The brand's boxes originate from sustainably-managed forests. And foam formulas from the Mustela BÃ©bÃ© line are biodegradable. Mustela is also actively involved in efforts that support infant development and the health professionals that care for children. Babies, young children, and expecting or nursing women have different skincare needs than the average person. Due to the delicate nature of babies both in the womb and those already born, women need to pay special attention to the beauty products they use on a daily basis. Some key ingredients in certain products can be potentially hazardous to unborn babies and young infants alike, while other ingredients may simply have very little research on their effects. For these reasons, it is vital that moms and moms-to-be choose natural and safe products for themselves and their little ones, like those in the Mustela Products collection. The line of Mustela Products includes everything from cleansers and baby shampoo to stretch marks cream, postpartum restructuring gel, and everything in between. Products are formulated to be gentle and safe for babies and mothers, yet still effective at treating individual skin needs and concerns. As a leading cosmetics brand in European pharmaceuticals, Mustela Products provide special treatment for babies especially, treating the skin without irritating it or causing dryness. The Mustela brand focuses on natural ingredients that are backed by medical testing. Safety is the greatest concern when it comes to products designed for expecting or nursing moms and babies. The best products for little ones and their moms are hypoallergenic and free from harsh chemicals, parabens, synthetic fragrances, and other chemical ingredients. The line of Mustela Products makes many great commitments to customers, from the promise of safety and effectiveness to pleasant texture and scents and an eco-friendly approach. Mustela Specific Support Bust gives breast skin a chance when it comes to the tolls pregnancy can take on the bust. This product can help to increase firmness of the skin while also relieving tension. This light and smooth emulsion also keeps skin supple and helps to prevent loss of elasticity. Breast tenderness is soothed and the skin stretching sensations are also eased with use of this product. Mustela Specific Support Bust contains no parabens, phthalates, or phenoxyethanol and is hypoallergenic and safe to use while breastfeeding. Mustela Stretch Marks Double Action helps moms to prevent new stretch marks and minimize existing ones on their tummies, breasts, hips, and thighs. This stretch marks cream also helps to keep the skin elastic and supple. This product contains no parabens, phthalates, or phenoxyethanol, and it is also considered hypoallergenic. The rich, creamy texture smoothes on comfortably. Mustela Stretch Marks Double Action is safe for use by nursing moms as well. Mustela Stelactiv is a creamy formula designed to treat severe diaper rash common to infants between 6 months and one year of age. This diaper rash ointment treats irritation with three anti-enzymatic agents to reduce and ultimately erase redness while repairing delicate skin. Relief is immediate and long-lasting and a protective Zinc oxide barrier provides additional defense from wetness and irritation. This special formula is non-irritating, non-occlusive, and free from fragrances, making it suitable for even the most sensitive skin. Mustela No Rinse Cleansing Micellar Water 10.1 oz. 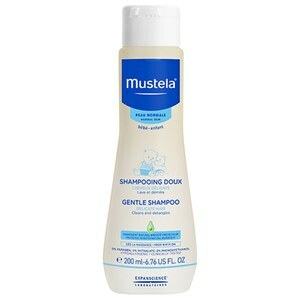 Mustela Foam Shampoo for Newborns 5.1 oz.